Of course a snack! Some fruit, an energy bar, a handful of nuts/pretzels, yogurt, trying to keep it healthy of course. Well, why not enjoy that snack while your best furbabie has one as well? Take time out and share snacktime with your pooch. Just open up a bag of crispy, crunchy, pupCHIPS for your four-legged friend. 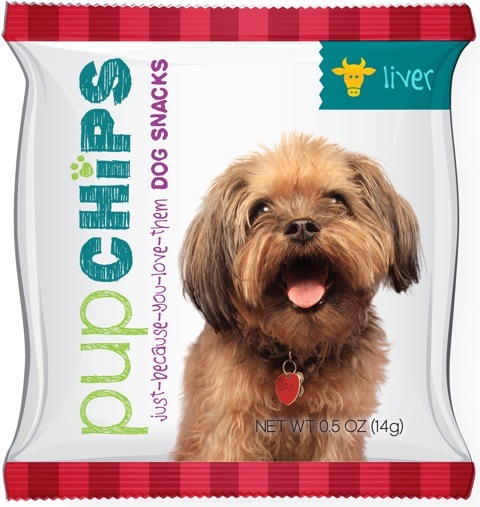 PupCHIPS is a new snack for your dog, “just because you love them”. Different than a treat earned in training, for doing a trick, for behaving politely when company is over, or any of those reasons – this is a snack for fido…just because you want to. 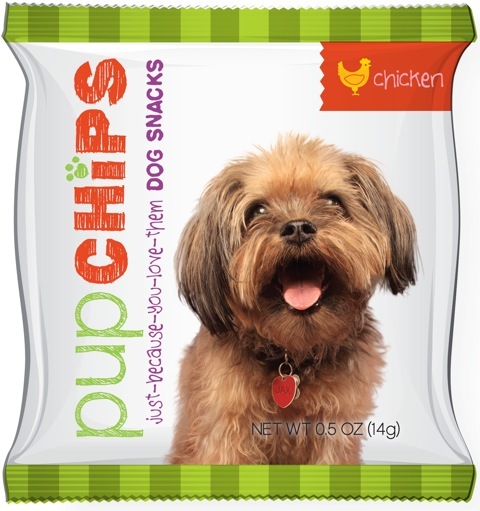 PupCHIPS come in flavors of Chicken, Liver, Salmon, and Yogurt & Berry. CHICKEN: Ground Rice, Ground Corn, Chicken Liver, Ground Barley, Chicken Powder, Chicken Meal, Sweet Potato Flour, Chicken Fat, Dried Brewers Yeast, Ground Flax Seed , Salt, Beta Carotene, Glucosamine Hydrochloride, L-Ascorbyl-2-Polyphosphate (source of Vitamin C), Chondroitin Sulfate, Hydrolyzed Poultry Liver,Tapioca, Natural Flavors, preserved with mixed Tocopherols, Vitamin E Supplement. Honestly, my dog, Chazz does not like crunchy. He doesn’t care for food that is hard or snappy. So when I gave him the “chips” to taste test…he wasn’t very interested…at first. He kind of pushes at it with his nose, but the chips never get near his open mouth. Later, I had an idea and I got out one of his bowls. Poured some chips in and added a little water to soften them up. I placed the bowl on the floor & returned to my computer & some work that needed finishing. When I came back downstairs the bowl was empty, pupCHIPS were gone! So the flavor was yummy! 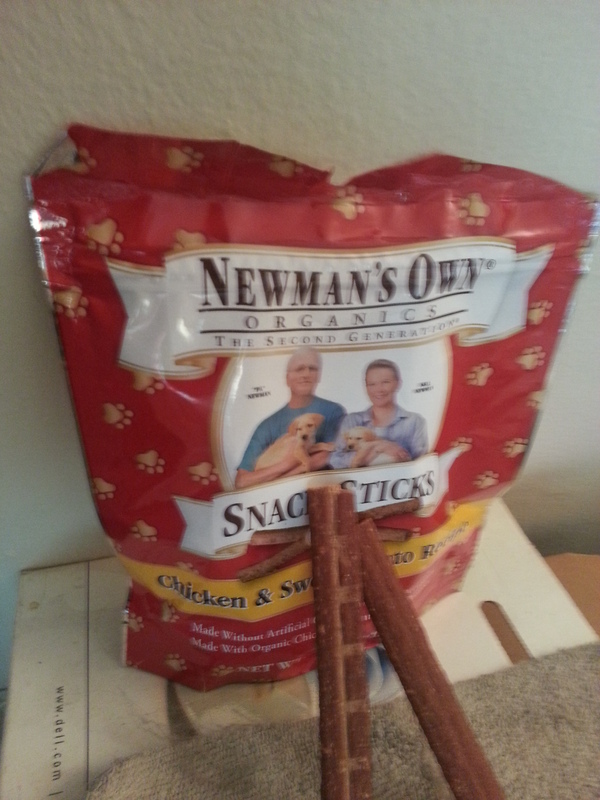 Chazz liked them and gives them a 3 paws up rating!!! And your dog will like them too. PupCHIPS come in easy portable snack size packs that fit in your purse, backpack, or dog carrier. You no longer need to drag a travel bowl, can or bag of dog food with you when you’re going to be gone a short while. Convenient & easy to bring along pupCHIPS is the answer. Review Attribution: AdoptedMomToChazzTheDog did not receive any kind of compensation for this product review. AdoptedMomToChazzTheDog did receive sample packages of pupCHIPS for the purpose of feeding to ChazzTheDog and doing a Product Review. The opinions expressed are strictly my own, one individual; and were not influenced in any manner from the outside.